I wanted a nice tree to walk in under as we came up to our front porch. I didn’t have the room to plant a big tree so I planted a smaller one that gets maybe 25-30 feet tall – big enough for my purposes for sure. In the following pictures I’ll show you how it’s grown so well over the last few years. It was small when we got it and I had to pick one that would allow me to train it so that it wouldn’t block the paths and stairs around it. I did a lot of work to accomplish that, including at one point tying it up so that it was straight, more or less. I dunno if that was really necessary but it worked and now it’s full and big and does the job I wanted it to do. See for yourself! January 2012 – in a little bit of snow – why’s it leaning? 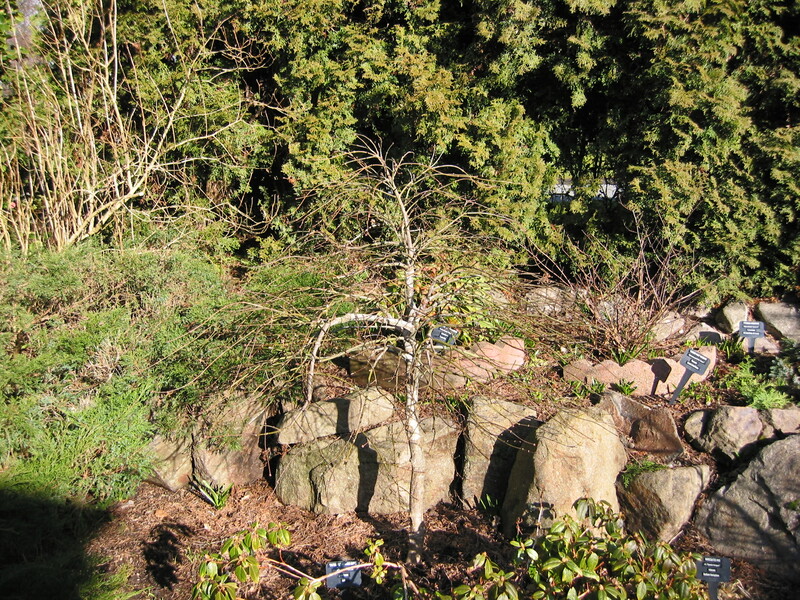 November 2013 – bare after leaf drop. See how skinny it is? May 2014 – lots of growth! October 2015 – gentle fall color – it gets brighter! March 2016 – just starting to grow – see how red the new growth is? April 2016 – in the rain – makes it look huge and cool-looking! June 2016 – today – big enough to be a real tree to walk under now – finally! It’s a bit hard to believe that this tree grew from a few sticks in 2010 to this 20 ft tree in about 7 years of growth. It’s still growing as I write this so I know it’ll get even bigger this year -and it’s still a baby in tree years. I did manage to accomplish my goal of keeping it very narrow so that we can walk up the stairs and into the garden without hitting our heads on the branches. It’ll get a lot wider and still another 10 feet of of height perhaps and pictures I’ve seen of big ones make me kind of shudder – it’s going to be a big tree here, despite it’s being classified as a “small tree” in my books. It doesn’t get quite as big as the straight species which will get over 40 feet – even 50 for a really big, old one. This one will do for us. 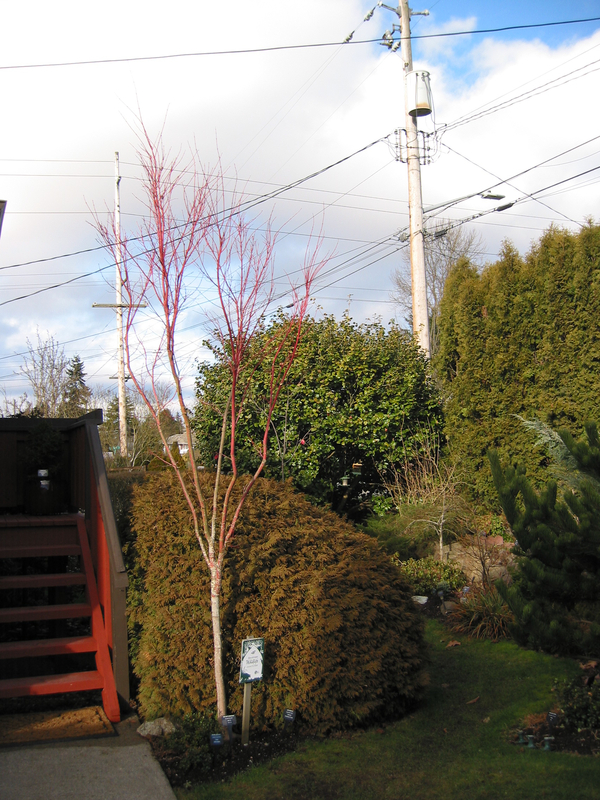 It’s also known as the Coral Bark Maple for the bright red stems it puts on when they first come out. It’s supposed to resemble a tower of sea corral in Japanese, thus the name – “Sango Kaku”. Its lovely in winter, especially with a bit of snow on the ground around it. As they age the limbs turn an undistinguished brown but I still like it fine.